I wasn't expecting to break a sweat when I visited Sony's Wow Studio here at SXSW, despite the sweltering 90-degree weather. The tech giant is showing off about a dozen interactive demos at an air-conditioned warehouse here in Austin, and the event sounded like it would be really chill. But Sony wanted to make its visitors feel connected to its technology, and what better way to engage than through physical exertion? 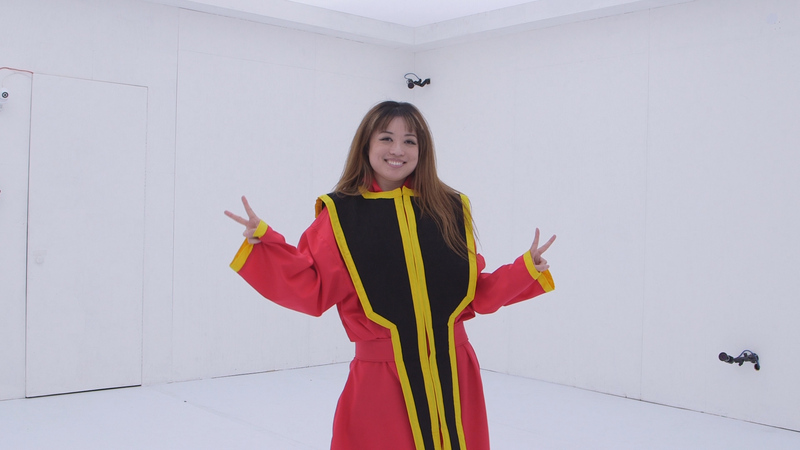 Although the company has been attending SXSW since the show's music festival days, this is only Sony's second time bringing a warehouse full of quirky mini adventures to SXSW, and it's expanded a bit beyond last year's VR-heavy affair. Walking into the Wow Studio this year, you're confronted with robots, photobooths and dark little rooms hiding mysterious demos with names like "Ghostly Whisper" and "Acoustic Vessel 'Odyssey'." You can stop to play with adorable new Aibos (that now understand English) if you wish, but the fun lies beyond the foyer. Some of them have obvious sports themes. Things like "VR Soccer" and "A(i)r Hockey" showed off creative implementations of existing tech. For example, the soccer demo had me firing penalty kicks at a menacing goalkeeper character from the popular Captain Tsubasa manga series. This would probably have been more meaningful for a fan of the franchise, but for me it was simply amusing. I was more impressed by the Air Hockey demo. 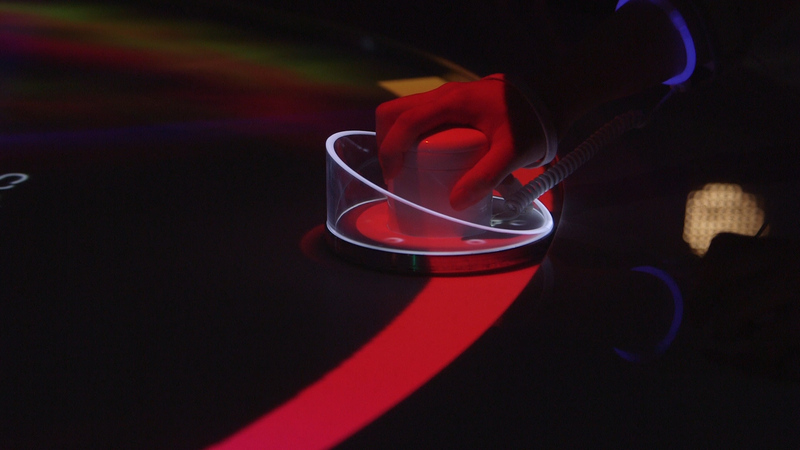 Using a pair of Sony's high-speed vision sensors, the system is able to track the puck and paddles on the table, and not only project colors onto each projectile, but also create virtual pucks. These come at you in later stages of the game, creating more challenging rounds. Each paddle also housed vibration engines that buzzed when you touched a virtual puck, making the impact feel more realistic. There was barely any lag between the haptic feedback and me making contact with one of these faux pucks. At the height of drama during the game, things got so crazy that I had a hard time differentiating between the physical puck and the digital ones. What's intriguing about this particular demo is that the sensors are actually being used in self-driving cars to study moving objects at speeds of up to 1,000 frames per second. But instead of explaining how all of that works in a boring slideshow, Sony encouraged its engineers to come up with creative ways to engage the SXSW audience. Shigeki Mori, head of brand strategy at Sony Japan, told Engadget that the mandate for employees when pitching SXSW concepts was to "please make it very experential." The goal was to make people "feel something about the output," and for the experiences to feel like "magic." Mori believes that encouraging creative ideas and engaging with the SXSW audience is a "great way to get input," which could eventually translate into something the company could use in the future. Few of the projects shown at the Wow Studio will ever actually be launched as products for consumers, but they do show off creative implementations of existing tech. At "Interactive CUBE," for example, Kinects, cameras and vibrating motors combined to facilitate games that let you use your body as a controller. In the "Rolling Rover" mini game, I had to swing my arms wildly to get the giant ball to move forward, and step side to side to make it go right or left. Nothing groundbreaking, but like any festival activation worth its salt, Interactive CUBE was extremely selfie- and photo-friendly (after you wipe off the sweat). Being a horror buff, I was most excited to check out "Ghostly Whisper" -- an installation borne from a collaboration between Sony and Universal Parks & Resorts. Billed as a "conceptual haunted experience," this simulated series of paranormal incidents uses Sony's Sonic Surf VR tech to play atmospheric sound, as well as send noises that seem to be coming from specific directions. I was pleased with the quality of the tech setup -- the eerie music and sudden flickers of sound were indeed realistic and felt like they came from where they were meant to. I only wish the experience had been more engaging, or that the plot moved along faster. Thanks to the long-drawn-out theatrics served by the tired-looking man in search of his daughter's spirit, I almost felt relieved when things started to shake and lights began to flicker. Before long, the otherworldly noises gave way to an unsatisfying resolution, and I was left wanting (so much) more. The chills I expected to feel never showed up, unfortunately. My disappointment at "Ghostly Whisper" was made up for at "Hero Generator," which used Sony's "Free-Viewpoint Visual Technology" to capture 360-degree footage of attendees to plop them in a superhero movie trailer. After being directed by a company rep, I made the appropriate faces and jumping actions while the room's 16 cameras recorded. I still haven't received my own superhero trailer just yet, as reps said it could take days to receive the file via the Sony Events app, but I'm excited to see how it turned out. 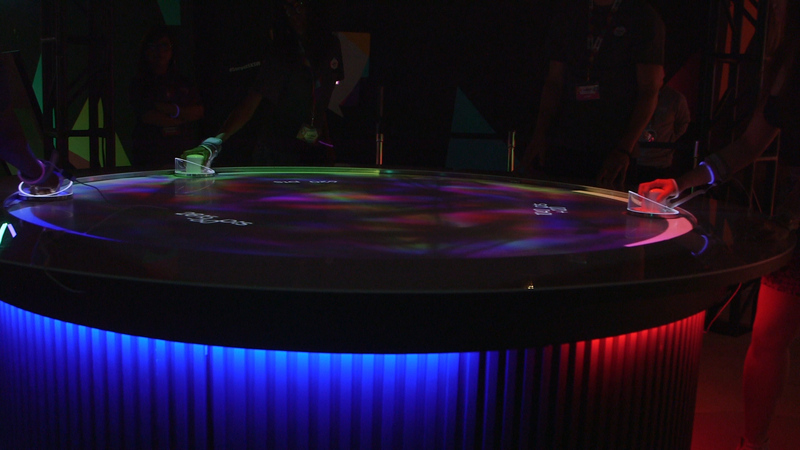 Ultimately, Sony has the right idea for tech demos at a show like SXSW. Focus less on explaining the tech or convincing people why you're here -- just wow your audience with magical experiences. On the whole, even if the components used at the Wow Studio weren't necessarily the latest or most effective, I was still convinced that the stuff Sony is working on could be put to good use.